Fast casual dining has become a huge trend as of late. People want quick food that they can customize themselves. 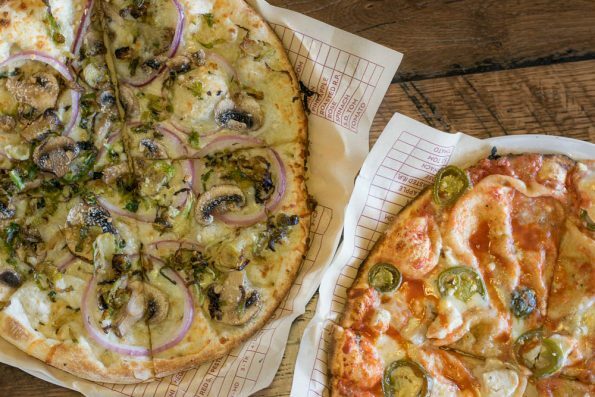 MOD Pizza is one of these fast casual dining concepts. 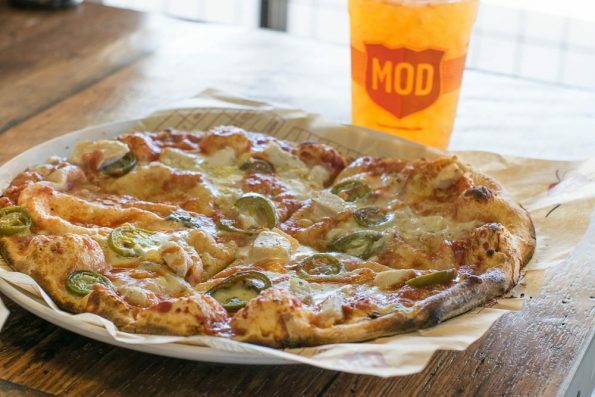 At MOD Pizza you can create your own custom pizza or select one of their pre-designed pies. What is great about MOD Pizza before you even get to the actual eating of the pizza is their price. Pricing is based on the size of the pizza and not the amount of toppings. This means you can load it up for no additional charge. When we visited MOD, we decided we wanted to try a few of their pre-designed creations. Afterall, if we made our own it wouldn’t anything different than we’d order elsewhere. As they say, “when in Rome.” So we tried The Sienna (brussels sprouts on pizza… No choice) and The Calexico. The Sienna was recently re-released due to its popularity. It is made with garlic rub, roasted brussels sprouts, red onions, sliced mushrooms, a hint of rosemary, mozzarella and grated Parmesan cheeses. This pizza is a veggie lovers dream! Savory and salty, it is a great pizza for someone who may not be crazy about tomato sauce. The roasted brussels sprouts were a fantastic addition which begs the question, why are more pizza joints not using them? The other pizza we tried was The Calexico. This spicy pie is comprised of mozzarella, gorgonzola, chicken, jalapenos, hot buffalo sauce and MOD red sauce. It was a unique take on the buffalo chicken pizza. Typically a buffalo pizza uses buffalo sauce in lieu of tomato sauce, not in addition to. We enjoyed the flavor difference that this brought to the pizza. Also, adding jalapenos is never a bad thing. We really enjoyed our experience at MOD Pizza. Not only were the pizzas fantastic (their crust is spot on), but the drinks were great as well. Their seasonal Caramelized Pear Iced Tea was really flavorful and interesting. We definitely recommend trying it before it disappears! What are some of your favorite fast casual restaurants? Have you been to MOD Pizza? What did you order? As always, we want to know! Leave a comment below or use the hash tag #GeekEats!